Crunchies Natural Pet Food Store is located just outside Annapolis in Crofton, Maryland. 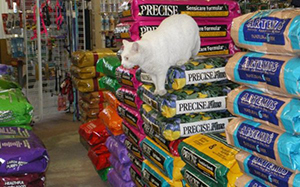 Crunchies has the largest selection of foods, vitamins, and supplements in the area for both dogs and cats. The shop has been open since 1995 and has already established a large and growing list of satisfied customers. The owners started by selling the high quality pet food from their living room, but quickly outgrew this and another shop until they finally expanded into their current location on Crofton Lane, just off of Route 3 South. What’s in Your Pet’s Diet... and Why Should You Care? You have probably heard the scary stories of feathers and beaks and “things” commonly found in pet foods. You may have experienced the pain and expense of caring for a chronically ill animal or may simply be waking up to the nutritional benefits to your own health and are wondering how this could also affect your animals. Whatever the reasons, hopefully you will get out the ingredient list of what you are now feeding your pets and compare these notes. In the last few years, holistic veterinarians and animal nutritionists have concluded that many of today’s health problems from allergies to cancer, and even behavioral problems, can stem from poor nutrition. We are not even talking about “table scraps," but the very prescription diets and premium food that come highly recommended. It’s a shame that you may be unknowingly creating the very problems that your pet has been suffering from. At Crunchies Natural Pet Foods, we have researched all of the different foods, treats, and even the vitamins and supplements that are available. We believe that we carry the most complete lines of natural, holistic and healthy dog and cat products anywhere. Crunchies is convenient from all over the Baltimore, Washington DC area including Bowie, College Park and Laurel in Prince Georges County, Columbia and Ellicott City in Howard County and all parts of Anne Arundel County MD including Annapolis, Severna Park, Severn, Pasadena, Riva, Edgewater, Jessup, Gambrills, Glen Burnie, Millersville, Arnold, Crownsville and Davidsonville Maryland.